Many reports claim these adult European crane flies (Tipula paludosa) bite or sting, but this is false. Most adult crane flies, which superficially resemble large mosquitoes with very long legs, eat very little, if at all. Adult crane flies live for only a few weeks, and when they find their way into your house they are really just nuisance. Crane fly larva in the soil. Why are crane flies around? Wet springs are associated with a high emergence and large populations of adults. The adults, which you may also see hovering around your lawn or landscape, are most likely looking for food or areas to lay their eggs. Larvae are brown and wormlike with very tough skin; they resemble caterpillars such as cutworms but lack legs. 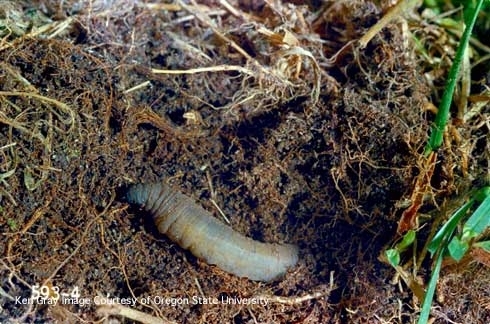 Crane fly larvae (also called “leatherjackets”) feed on roots and crowns of turfgrass, but lawn damage from crane flies is usually only seen along the Pacific Northwest coast. In California, damage has been found mostly in Humboldt and Del Norte counties, rarely in warmer, dryer inland areas of the state. Keep your doors and windows closed to prevent them from entering your house. Unfortunately, there's nothing that can be done to control the adults that are emerging now. Proper lawn care and irrigation are important in reducing crane fly populations. Avoid over-watering lawns and ensure good drainage by aerating your lawn. In fall, remove excess thatch that may have built up during the year. 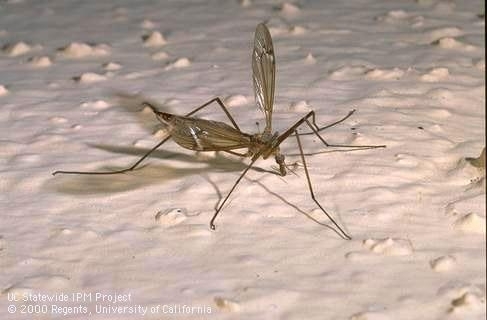 Find out more about crane flies by reading the UC IPM Lawn Insects Pest Note. We used to call them bombers as they look like oversized squitters. Great information to burst the bubble on another urban myth about "mosquito eaters."